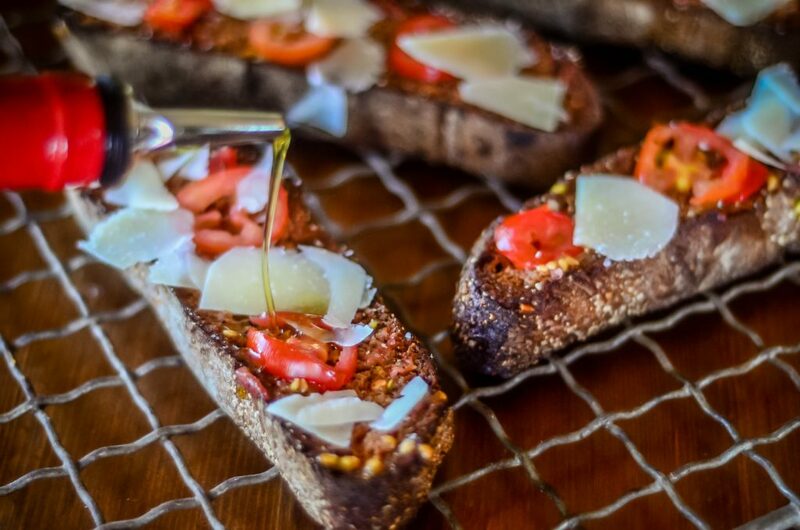 Crispy Bread with Tomato and Asiago. AKA: Tomato Toast. At least, that’s what Georgia calls is. Born of the ruby beauties currently hanging from sprawling branches in my overgrown August garden, this snack, appetizer, or side dish is about as delicious as it gets. Simple preparation, bright flavors, and contrasting textures. It’s all the goodness of a casual summer smeared into one. While it may seem like a strange concept to smear the tomato, I assure you, it’s essential. We’re harnessing the taste of the tomato without the slippery texture messin’ up our juju. And ain’t nobody needing to be messin’ with my juju, man. I’m having a hard enough time as is remembering what my name is half the time. I’m blaming that on the three leeches, I mean children, who inhabit this farm home. And speaking of, I should mention how much they adored this dish. What’s not to like? It’s pretty much a simplified and romanticized version of a a grilled cheese. 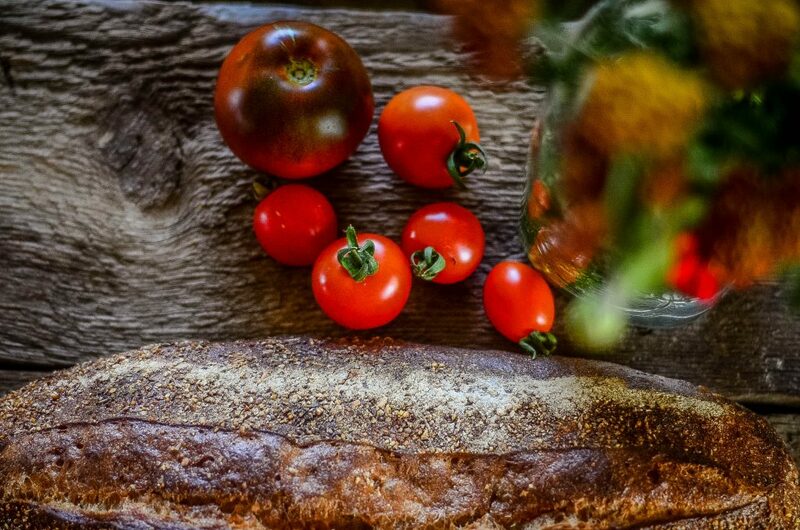 Instead of packaged bread, full of preservatives and questionable ingredients, we’re utilizing a hardy, artisan loaf that’s been fermented and baked with care. Instead of mounds of cheddar cheese, we’re highlighting sharp, nutty Asiago. And instead of dipping it in ketchup (was I the only one who dipped my grilled cheese in ketchup growing up?) we’re brightening the flavors with garden tomatoes. Sometimes it’s cool to be a grown up and have grown up tastes. But it’s even cooler when your kids are totally on board and enjoy those tastes too! Shall we? I think we shall. 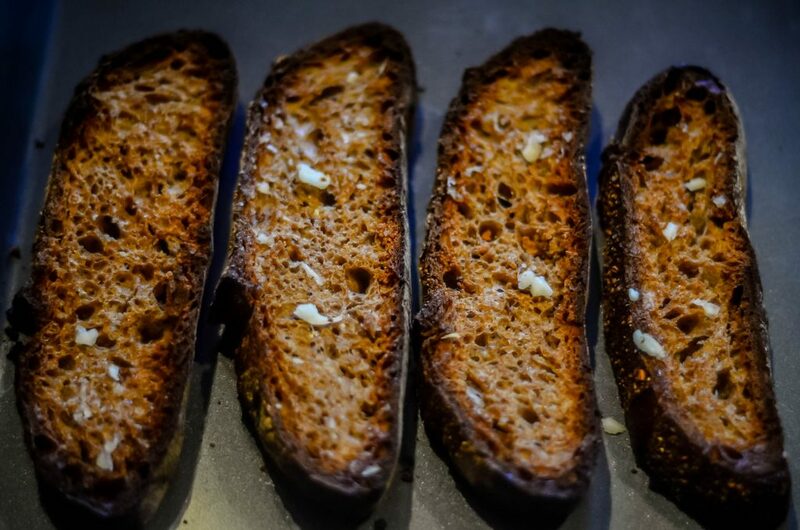 Lay the bread slices on a baking sheet and toast in a 375 degree oven for about 5 minutes per side, until just golden. Don’t overtoast or it’ll be difficult to eat! After the bread has toasted, remove the pan from the oven. Gently rub the garlic clove evenly over the slices. This will help to give it a slight garlic flavor without overpowering the other flavors. Garlic can punch you in the face, man. That’s not what we’re going for here. Rub the tomatoes generously over the slices. The insides of the tomato will mush and smear into the bread and you’ll be left with the skin at the end of it all. Discard. 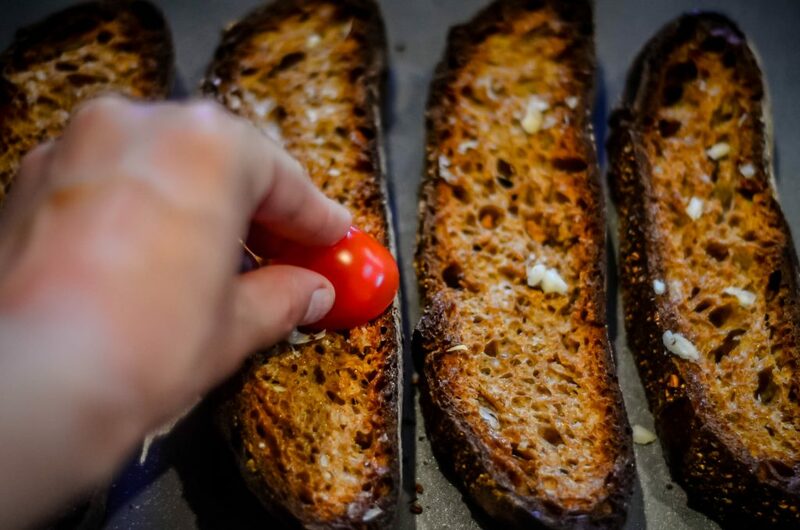 Repeat the tomato smooshing until each slice of bread is coated in all that pink hued tomato magic. If you’d like, you can incorporate a few small pieces of the tomato to make it look prettier. I did. I have a love for tomatoes that knows no bounds. … and drizzling ever so slightly with olive oil before serving. Now you may be saying to yourself: Self! What is Shaye thinking? That’s practically a non-recipe it’s so easy! She’s a terrible chef. Like, duh! We could’ve done this on our own! Which may be true. But have you? 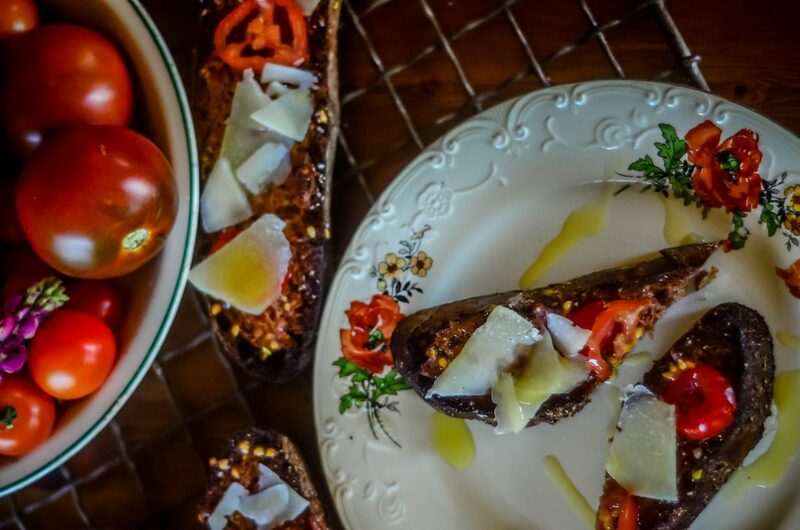 Have you experienced the pure delight of biting into crunchy, artisan bread that’s been smothered and layered with the beautiful flavors of garlic, tomato, and Asiago? Have you? HAVE YOU? Okay. You may have. But you may have not. And for the have nots, I present the Crusty Bread with Tomato and Asiago. 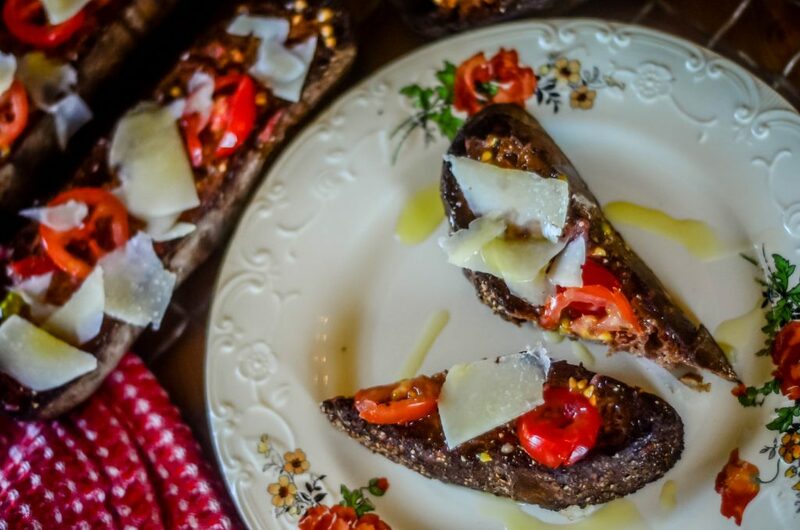 Because life’s too short to not enjoy the simple pleasures of this dish, served alongside your favorite brand of Chianti. The only thing that could make this better is if I was enjoying it on a vineyard in Sienna. Leeches, I mean children, may or may not be welcomed in this fantasy. I’ve yet to decide. The good news is they love this toast. I love this toast. And I’m pretty sure everyone in Sienna would love this toast too. After the bread has toasted, remove the pan from the oven. Gently rub the garlic clove evenly over the slices. Rub the tomatoes generously over the slices. The insides of the tomato will mush and smear into the bread and you’ll be left with the skin at the end of it all. Discard. 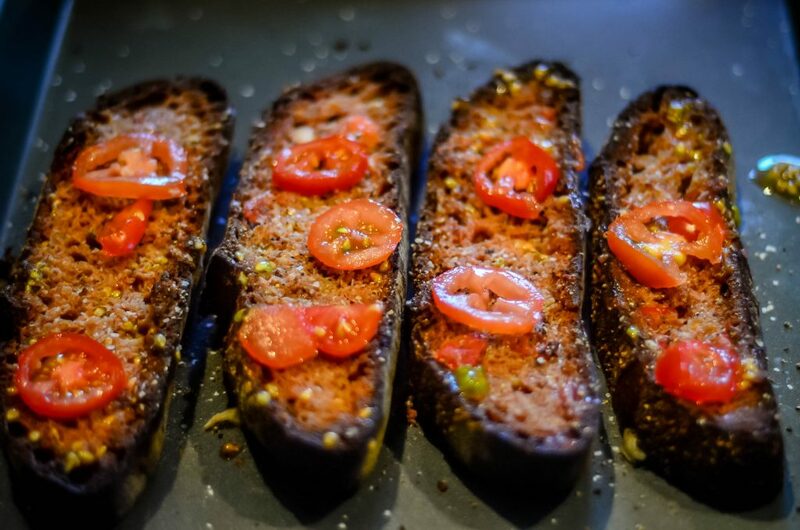 Repeat the tomato smooshing until each slice of bread is coated in all that pink hued tomato magic. If you’d like, you can incorporate a few small pieces of the tomato to make it look prettier. Could you please send me an actual copy of your cookbook? I bought it through paypal but I didn’t realize it was on the web only and I have extreme difficulty accessing the web on a regular basis. I too, live on a farm in Manson, WA. you can contact me through my email and then I can give you my physical address and phone number.